People from Pakistani tribal areas participate in a rally in Karachi, April 8, 2018. Thousands of people from Pakistan's tribes have rallied in Peshawar and in Karachi demanding the release of suspects being held by authorities on alleged links to militants. Television stations in Pakistan are under fire for their continued black out of peaceful rallies by an ethnic Pashtun movement against extra judicial killings and enforced disappearances of Pashtuns, particularly those living in the volatile tribal areas bordering Afghanistan. Pashteen said while addressing Sunday’s rally his community is calling for their constitutional "right to live without fear”. He emphasized again PTM is a peaceful movement and its demands are constitutional. 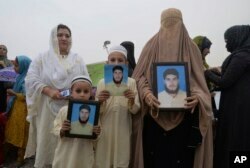 A family from a Pakistani tribal area display pictures of a missing family member during a rally in the northwestern city of Peshawar, Pakistan, Apr. 8, 2018. Human rights defender Tahira Abdullah condemned the media blackout for not reporting on the rally “out of fear of the establishment.” The term "establishment" is used in Pakistan for military-led security institutions.